There are two possible routes to our union: the university administration can agree to a free and fair process for certifying our union, or we can seek certification through the National Labor Relations Board (NLRB). Under either scenario, building and maintaining strong majority support among graduate student workers will drive the success of our campaign and make our union more democratic and representative. 1) Form a Diverse Organizing Committee. This is made up of leaders from every department who will help organize the union. Members of the organizing committee answer questions, get the word out, build support, and help make strategic decisions about forming our union. The names of many organizing committee members appear at the bottom of every BUGWU-UAW authorization card. 2) Build Majority Support. To build support for the union, we collect signed union authorization cards from graduate workers across all Boston University campuses. These cards establish the level of support for the union. In addition, they provide a means of gathering up-to-date contact and work information from graduate workers who support the union. These cards are ultimately used in the recognition or NLRB certification process (see below). 3) Union Recognition. With the supermajority established, we can establish the union one of two ways. 4a) Demand Recognition from the BU Administration. We will approach the administration and demand they agree to a fair process for certifying our union. They will have the opportunity to do the right thing by simply agreeing to recognize our right to form a union. Graduate workers took this approach at NYU in 2013, resulting in a 98.4% “Yes” vote in their union election. 4b) Petition the National Labor Relations Board (NLRB). If the university administration is unwilling to agree to a fair process for establishing our union, we will petition the National Labor Relations Board (NLRB), the federal agency responsible for certifying unions. We will deliver our signed union authorization cards to the board, which will compare them to a list of eligible workers provided by the university.If the NLRB verifies that enough BU grad workers of workers have signed authorization cards, the board will schedule an election. 5) Union Election. All eligible graduate workers will be able to cast a vote on unionization. If a majority of the graduate workers who participate in the election vote YES, our union will be certified. 6) Elect a Bargaining Committee. Once our union is certified, we will elect our bargaining committee. This committee will consist of graduate workers from Boston University, elected by the BU graduate worker membership, who are willing to take on the commitment of helping to negotiate our first contract. 7) Collect Bargaining Surveys. The bargaining committee will circulate surveys that members will use to tell the committee what they want to see in a contract. This is an opportunity for all workers to describe the changes they would like to see in their working conditions and compensation, as well as to emphasize which current aspects of their work that they would like protected. 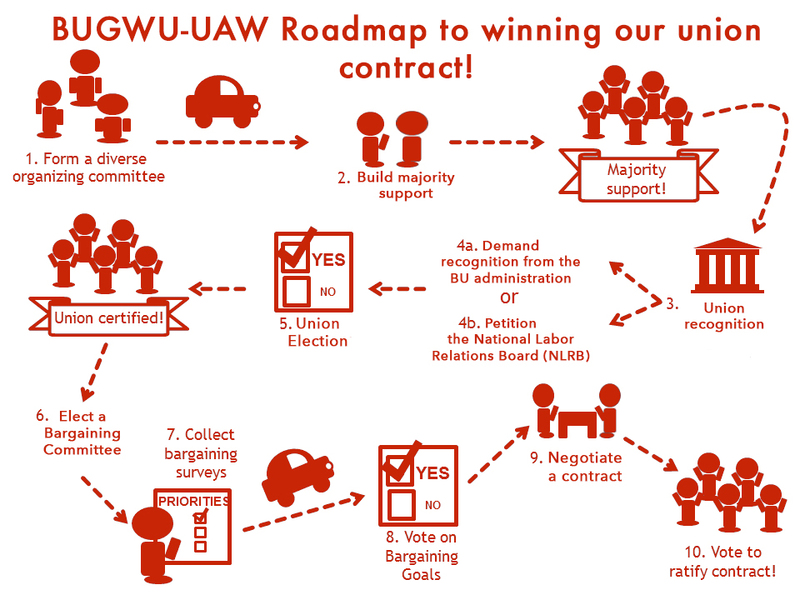 8) Vote on Bargaining Goals. Based on bargaining survey responses, the bargaining committee will create a list of bargaining goals, which will be broad and all-encompassing. These goals must then be ratified by a vote of the membership. 9) Negotiate a Contract. With the priorities established in the bargaining survey, the committee will bargain a contract with the administration. 10) Vote to Ratify the Contract. The bargaining committee will negotiate a draft contract, called a “tentative agreement,” with the administration. The membership will then vote on the agreement. If they ratify it, then we have our first contract. If they choose to reject it, then the bargaining committee will return to the negotiating table. 10a) Union dues. Graduate workers do not pay dues until we have voted to ratify our first union contract. 11) Contract Enforcement, Election of Officers, and Governing Our Local Union. Once we have our first contract in place, we will elect our officers and stewards, whose responsibility is to enforce our contract. We will also vote on a set of bylaws which will determine how we govern our local and how we spend our dues. Copyright © 2019 Boston University Graduate Workers Union – UAW. Powered by WordPress. Theme: Spacious by ThemeGrill.